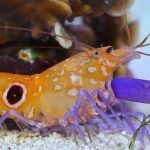 A cleanup crew or CUC as you will see it abbreviated a lot online, is a collection of creatures you can add to your aquarium that perform various beneficial functions. 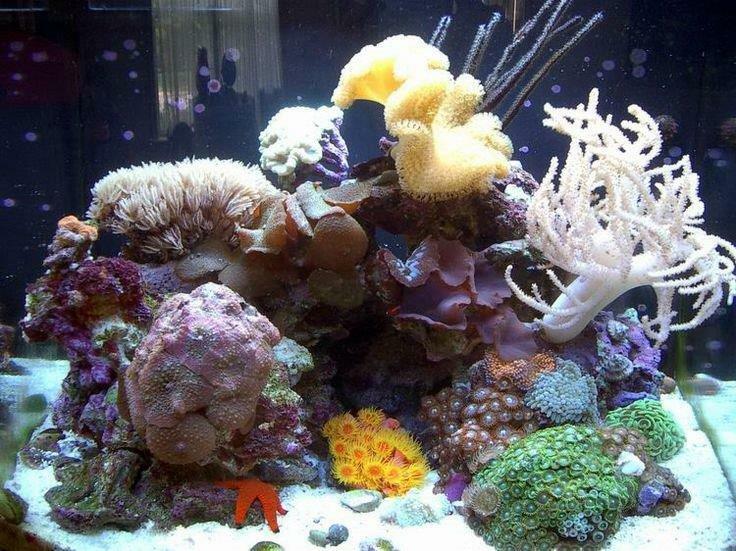 They will assist in cleaning and maintaining optimum water quality. But which ones do you need and what do they do? Do I have to have a cleanup crew? What is the benefit of having a cleanup crew? How big of a cleanup crew do I need? What creatures should I have in my cleanup crew? Like many things outside of water and salt, the answer is no. A small contingent of people will even argue against them. 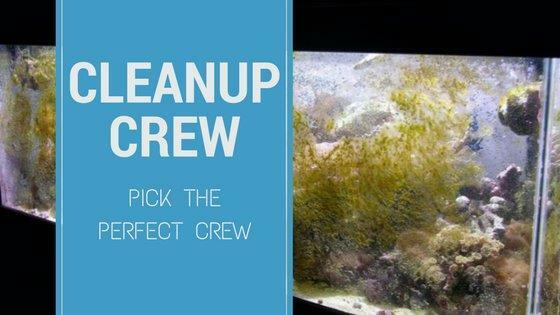 The general consensus though, is that a good well rounded and properly stocked cleanup crew is beneficial and should be utilized in a saltwater and especially a reef tanks. There are five major benefits to having a cleanup crew. They will sift through the sand stirring it up and eating all the crud that is growing in there or has settled beneath the substrate surface. This is a big help to helping maintain appropriate oxygen levels in your substrate. 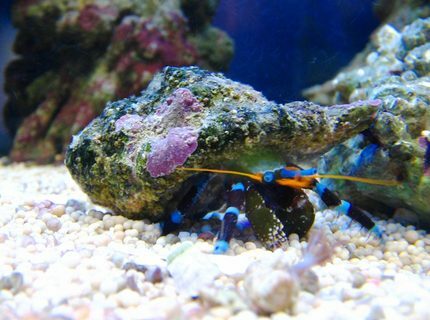 They eat unwanted critters that hitchhike into your tank in live rock and along with coral. We can be as good as we want to be at curing, dipping, and quarantining but if you keep tanks long enough; it is inevitable you will get some type of unwanted hitchhiker. Having the right hunter on the team that likes to eat your type of pest will take care of that. 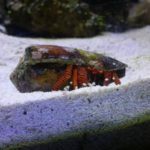 Finally, they are friggen awesome creatures to watch crawl around the tank! 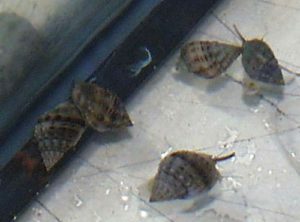 Snails make up the bulk of the aquarium janitor crew. 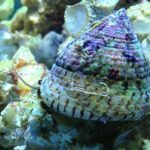 Snails clean everything and can go just about everywhere in search of food. They will climb the glass rocks and even get down into your sump over time. I recommend to aim for about 1 per 10 gallons. Start off at 1 per 30 and work your way to that though based on your rock work and feeding needs. Know that not all Snails are created equal, snails like turbo and trochus are bigger and will eat more than a margarita. The down side to a lot of species is once they are on their back they done for though. 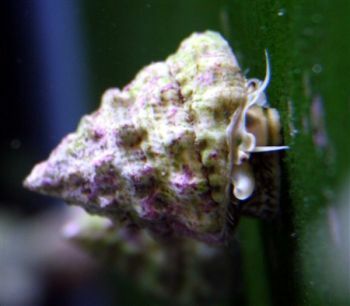 Nassarius Snails will glide around the team in search of food, spends most of its time burrowed in the sand with its antenna sticking out like a periscopes. They are referred to as walking dead shrimp because of the way they come out of the ground when food is put in the tank. 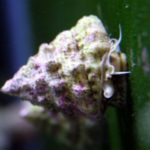 Bumble Bee snails have many benefits. They are small and can get into places other snails can’t. 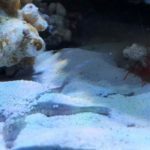 They like to burrow into the sand in search of food which helps to keep your sand bed from being stagnant, and they are carnivorous and will go after troublesome bristle worms but unfortunately will also feed on the beneficial bristle worms as well. Eats – Detritus, meaty leftovers, nuisance worms, etc. Cerith snails are a medium sized snail. They are voracious eaters but do most of their moving around at night. Some species are even known to burrow in the sand but will most likely stay on the rock and glass. 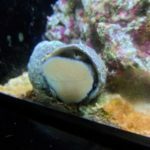 Aside from knowing how to have a great time, Margarita snails are a great source for seeding you tank with purple coralline algae. I have never had gotten a batch of these and not had some of them showing patches of the stuff. They will clean your rocks and glass but are not really good at turning standing up straight once they fall on their back, too many drinks I guess. So if you notice them on their back help them out. 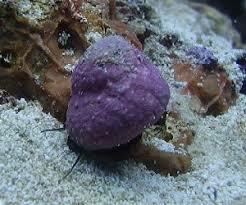 Trouchus snails are a bigger snail when full grown but not rock moving big. They will mow through your tank clearing out the algae. These snails will also focus on cyanobacteria and diatoms giving them added usefulness in your crew. Another great benefit that sets these guys apart is the fact that when knocked over they can normally right themselves saving their own life and your wallet. Great at cleaning your rockwork and they can also climb the glass. Just make sure to keep an eye out, if this big boy falls on his back he isn’t getting up on his own. 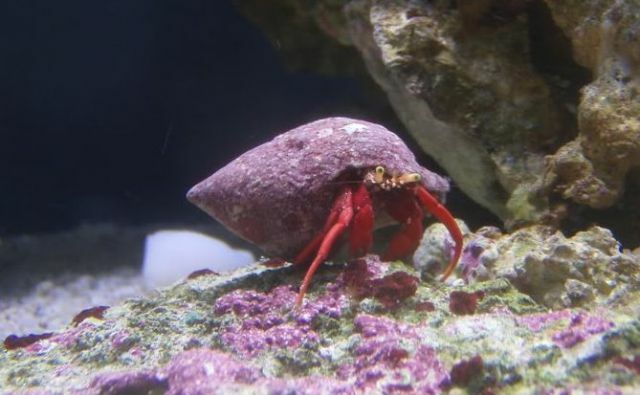 They have one of the biggest appetites of the snail family though. They will decimate algae but will skip the standard stuff if there is hair algae, cyanobacteria, or diatoms in site. This makes them a sought after addition. Differing from their Astrea cousin in shell design and waters of origin they share in many of their other characteristics. 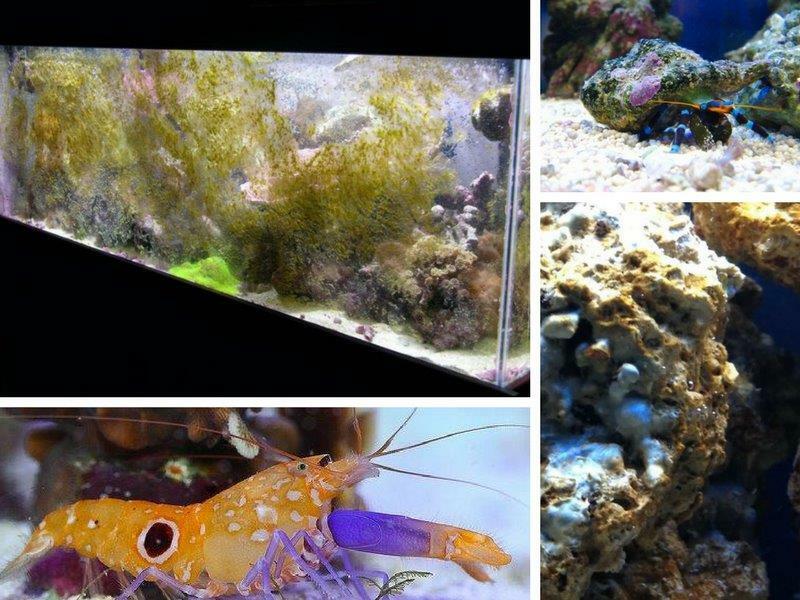 They are avid algae eaters including nuisance hair algae, etc. They do like to push their way between rocks though in search of food and if the rock tumbles they are ok with it. 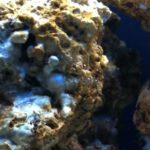 So make sure your rockwork is secure and best glued with these algae destroyers. Crabs come in a close second for most popular cleaner. Crabs will go all over the sand and rockwork in search of food. 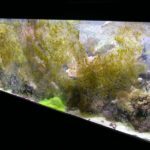 Some may even climb the first few inches of glass if there is enough algae to grab a hold too, but won’t really keep the glass clean. These too should be somewhere in the ball park of 1 per 10 gallons. Crabs primary focus will be cleaning up left over food and detritus followed closely by algae detail. Identifiable by their name sake blue legs purtruding from their shell, these are a cool addition to your tank and interesting to see moving around. 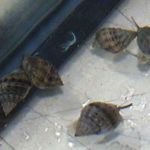 They can grow to fill a 1 ½” shell and will go after your snails if there are not enough empties laying around from their current size to max size. That said they are great at hair algae and detritus along with some forms of cyanobacteria and film algae. The Scarlet or Red Leg Hermit is identifiable by their bright red legs and yellow face. One of the more peaceful hermits these are great scavengers and will consume copious amounts of detritus. They are also huge fans of the filamentous, slimy, and hairy algae. 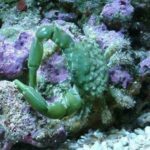 Emerald Crabs take on your more traditional non-hermit shape. The shell of these crabs has a green hue with some being brighter and more pronounced than others, but all will have hairy legs. 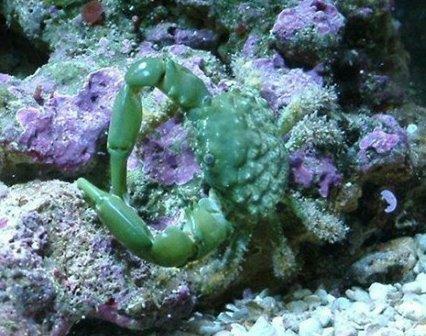 These crabs are great scavengers but are most often added to the crew because in addition to their looks and standard stuff most crabs eat, emeralds are fans of bubble algae. This festive addition is really cool because of its coloring. 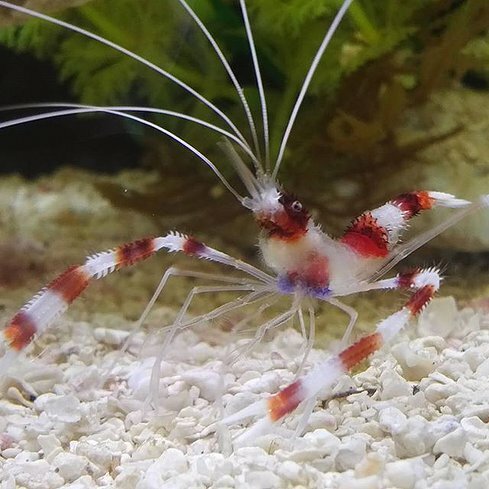 The orange and red bands on its legs definitely show why it was given the name. Although their color gives them the cool factor, their diet of cyanobacteria and hair algae in addition to the standard detritus/leftover mix gives them some versatility also. 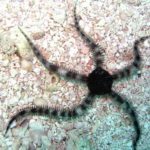 When I refer to starfish for the cleanup crew I am probably not talking about the sea star / starfish that caught your eye at the local fish store, although many of those do a great job on the glass and rockwork. The ones in your cleanup crew will come out to play from time to time but will spend more of their time hidden in those places you can’t clean without really tearing your aqua scape apart. 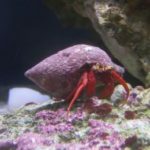 They are also going to require a more mature tank as their food source will often include many microorganisms that will cultivate in your tank over time. Aim for 1 per 50 gallons again based on rock and sand volume and wait until around 9-13 months before introducing them to the tank. Color wise they are a good bit more muted than other sea stars they can be a big benefit especially if you have a big sand bed. These guys will spend most of their time digging through your sand bed in search of food. The amount of sand they will overturn for their size is amazing. This also mean that they need a good bit of sand to sift through in hunt of food or they could starve and die. 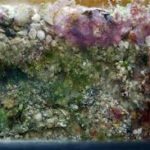 Because of this a minimum of a 50 gallon tank with several inches of sand is recommended with at least two inches of sand for each one you add. So if you only have a 90 gallon tank, just stick to one. Eats – Detritus and left over foods will be its main diet in a well fed tank. If that dwindles though it will feed on small invertebrates including bivalves, shrimp, mollusks, and urchins. 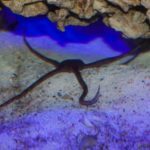 Brittle Sea stars are the ultimate scavenger. They tend to be nocturnal hiding under your rocks in the day and coming out to forage at night. 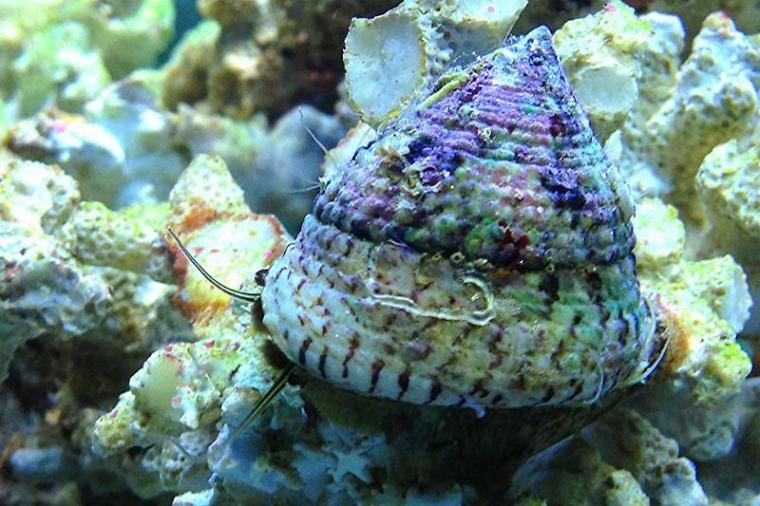 These come in a huge variety of colorations and hail from just about every part of the ocean that has a reef. 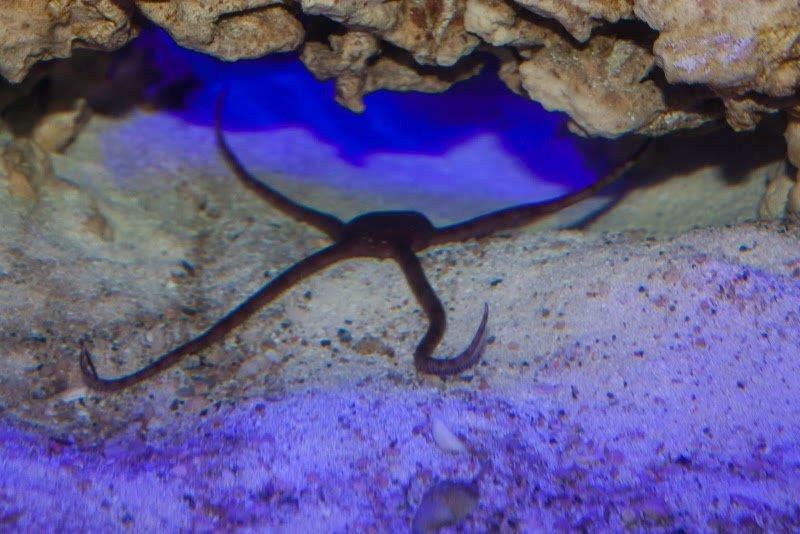 They won’t be seen often but are wicked cool to watch crawl around the tank when you do. 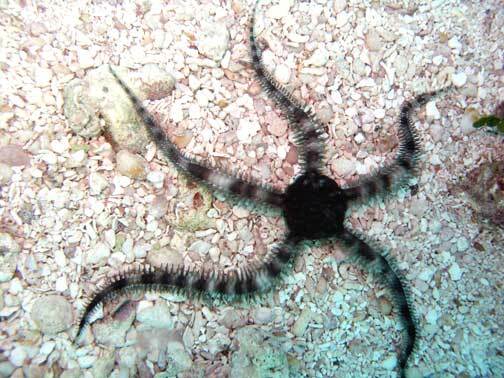 The Serpent star fish is generally a nocturnal creature by nature. Over time they will often start to come out during the day at feeding time to scarf up any meaty food bits that hit the rock and substrate. Their center mass is a 5 sided pentagon shape with an arm protruding from each corner. They range in color of green, maroon, and orange with some having bands or other markings to identify their specific species. Shrimp are awesome to look at and can server a few purposes. 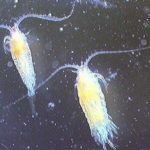 Most will eat detritus but depending on the specific species, some will also clean fish, sift sand, or even eat unwanted hitchhikers like aptasia and bristleworms. 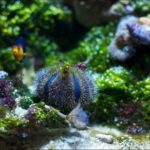 Often kept for their keen appetite for Aiptasia, a small hitchhiker anemone, although some peppermint shrimp have been noticed to skip the Aiptasia when detritus fish food are available in abundance. I guess every shrimp has their own taste buds just like humans. 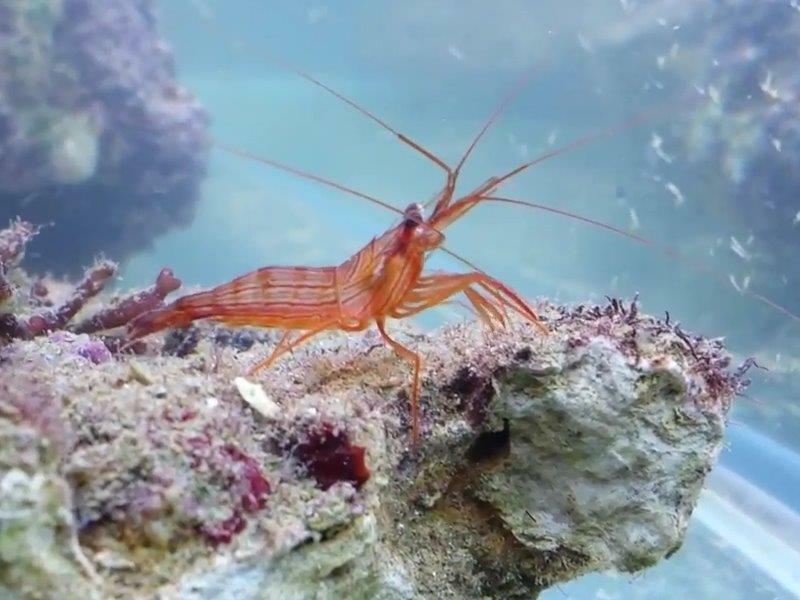 Quickly identifieable by their banded stripes and large front leg pinchers, coral banded shrimp often find themselves taken home for their looks alone. They are known to have a sweet spot for bristle worms and will hunt them down in an aquarium. 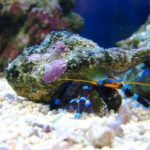 If not already in an aquarium these are generally quickly added if nuisance bristle worms are noticed. 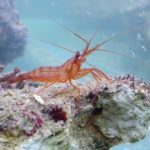 Pistol Shrimp often called Snapping Shrimp and Symbiosis Shrimp are beneficial because of their ability to churn through and aerate your sand bed. They come in a variety of colors with the common being red or striped beige. More expensive variations include blue and purple pinchers. When kept in pairs one will keep watch while the other burrows a nest into the sand. 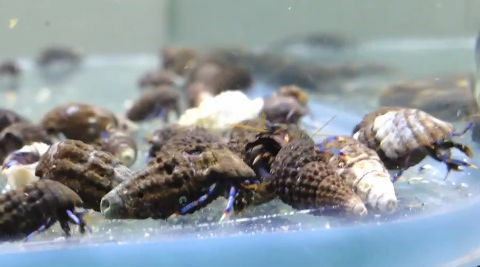 What is even more amazing is that if kept with Goby’s they will form a Symbiotic partnership where the Goby keeps watch and the near blind shrimp will keep their burrow dug out and clean. 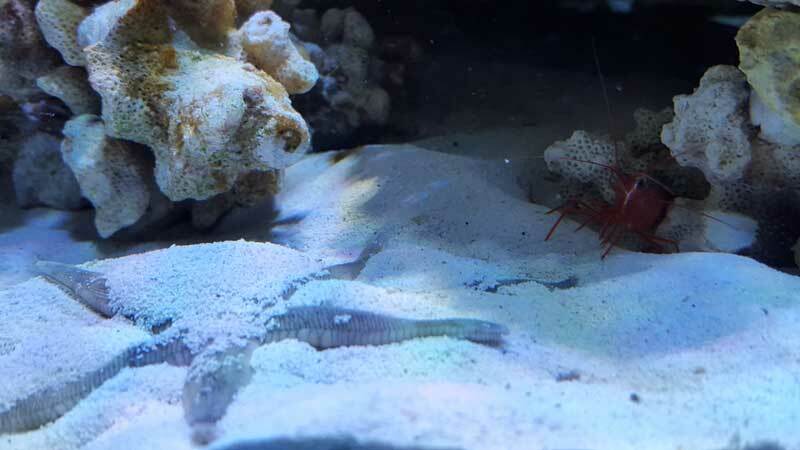 The Shrimp will share their food with the Goby for this watching eye as well. 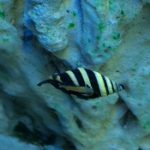 The Skunk Cleaner fish is most commonly found with a yellow to brownish yellow underside and a bright red back and a single white strip running down the center of it. 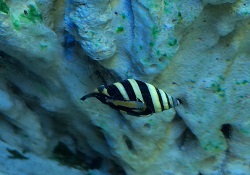 Its long white antenna will typically stick out of the rocks giving away its location. These shrimp will actually not hide too much. They will rather stay out on the rockwork allowing fish to swim up and be cleaned by them like a fish wash. 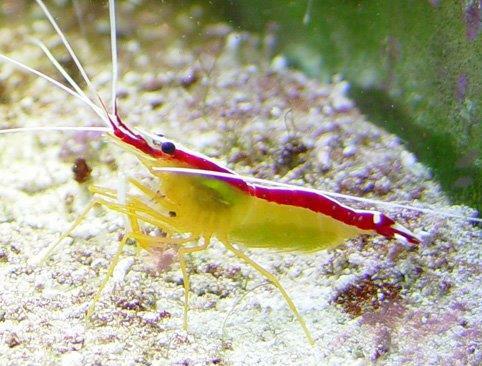 The Scarlet Skunk Shrimp will actually eat the ectoparasites(like ich) and dead tissue off the fish. In some cases they will even play dentist cleaning between the more trusting fish’s teeth. 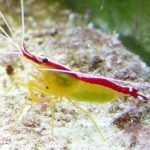 Eats – Outside of what they get from cleaning your fish they will also eat some algae but will pull most of their diet from the meaty bits that get past your fish and make it to the bottom of the tank. 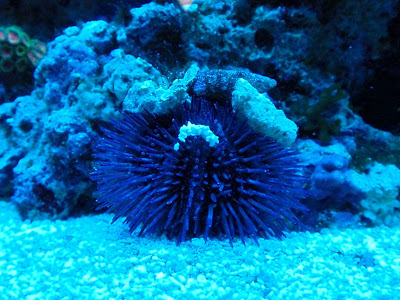 Urchins make for a cool addition to the marine tank. Be careful with most species though. 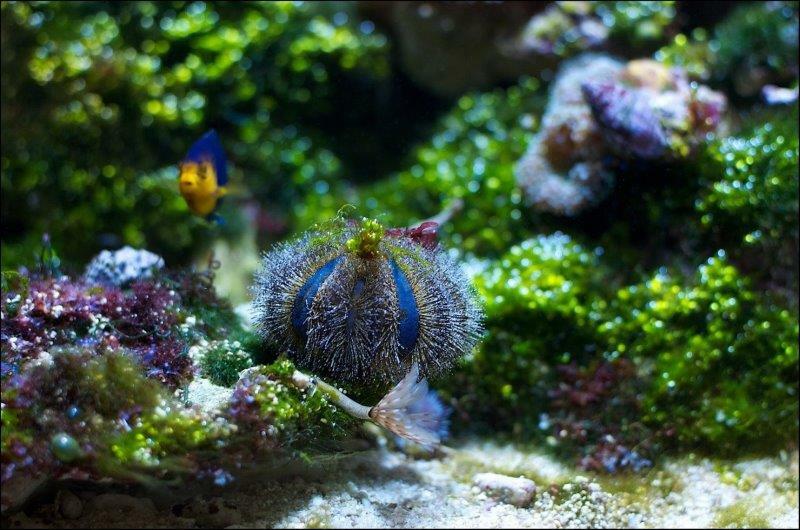 Tuxedo Urchins excluded, most Urchins are known to bulldoze the tank. Ensure a tank you put them in has the rock work secured and glued together where appropriate. Urchins can and will topple unstable structures. Given a safe home these guys will tear through algae though. 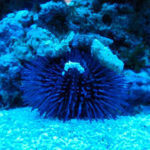 Tuxedo Urchins come in two color variations the Blue Tuxedo and the Red Tuxedo. Both have a similar blue center but the Red Tuxedo is adorned with red spines as opposed to the Blue Tuxedos Blue to Brown spines. 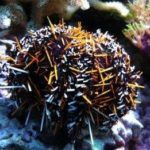 The tuxedo urchin is one of the smallest max size urchins there are and due to this typically keeps it from moving around any of the larger rockwork in your tank. It does like to grab smaller objects and carry them on its back as camouflage though. Pincushions come in colors ranging from blue, red, and purple. 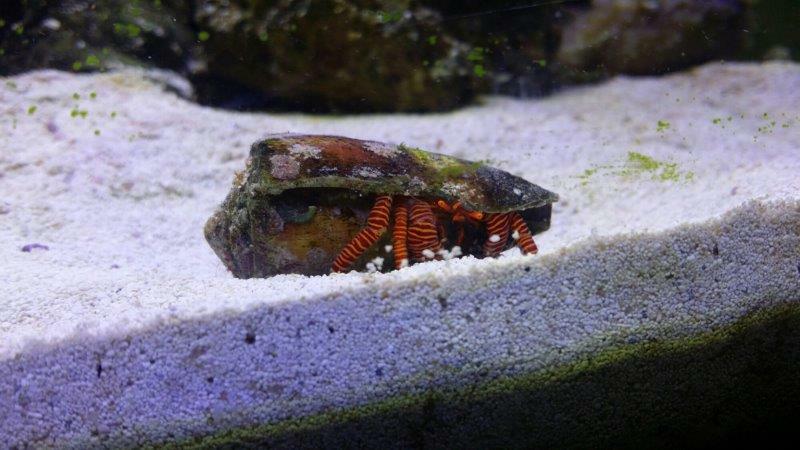 As they move around the tank they will wedge themselves in to any and all crevices they can searching for food. This is often why they will topple your aqua scape. 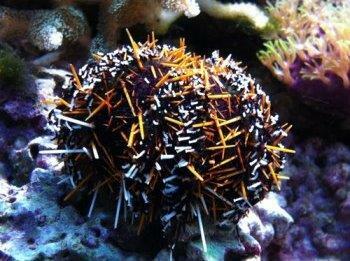 Though its max size is the same as the Tuxedo Urchin it is more apt to topple rock piles. 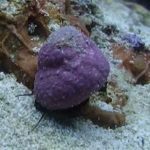 This is due to its tendencies to burrow into the substrate at the rock base and that it will burrow small crevices into calcium based rock or dead coral can cause instability in the rock. A well balanced tank is going to grow pods naturally. 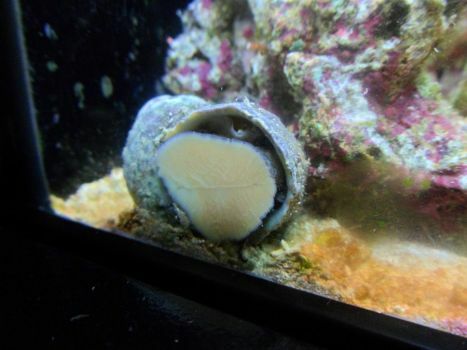 They will get into your tank via live rock, substrate, or as coral hitchhikers. 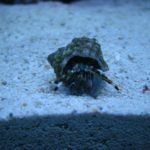 These provide benefits not just in eating micro detritus and algae but also by becoming a food source for other creatures in your tank. Some fish and inverts will feed on nothing but these in their natural habitat. 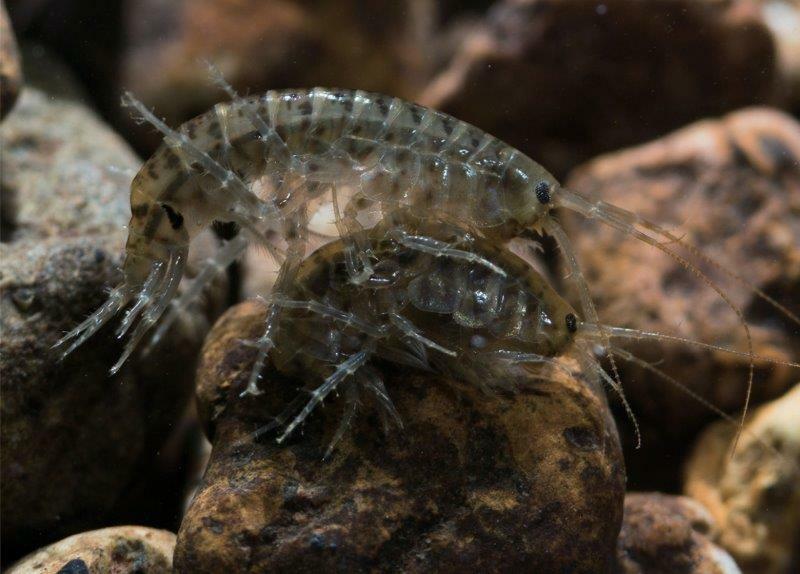 Amphipods are the larger of the two pods and are typically what most people notice in their tank. 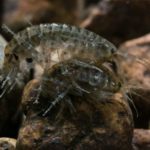 They are about the size of flees and may even be mistaken as baby shrimp to the unknowing. Copepods are the smaller cousin to the Amphipods. 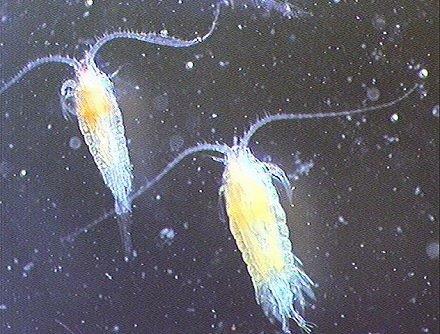 Most times if you see copepods you will have seen Amphipods and will just consider them to be babies of the larger. Did I leave your favorite cleaner out? Let me know in the comments so I can consider adding it in future updates! Do you need one no, should you have one yes! 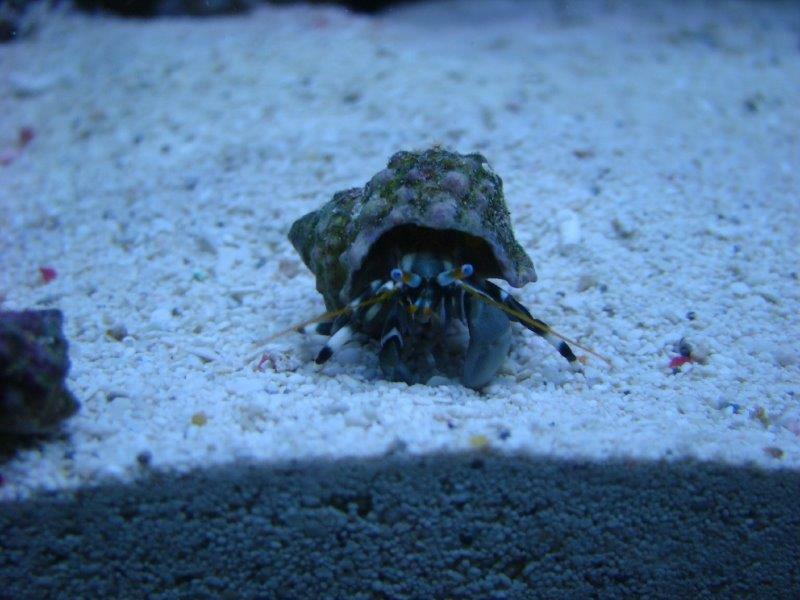 Building a solid cleanup crew will be a tremendously beneficial step in setting up your tank.